A review from the International Programme on the State of the Ocean (IPSO), warns that the oceans are facing multiple threats. They are being heated by climate change, turned slowly less alkaline by absorbing CO2, and suffering from overfishing and pollution. The report warns that dead zones formed by fertiliser run-off are a problem. It says conditions are ripe for the sort of mass extinction event that has afflicted the oceans in the past. It says: “We have been taking the ocean for granted. It has been shielding us from the worst effects of accelerating climate change by absorbing excess CO2 from the atmosphere. It says the cocktail of threats facing the ocean is more powerful than the individual problems themselves. 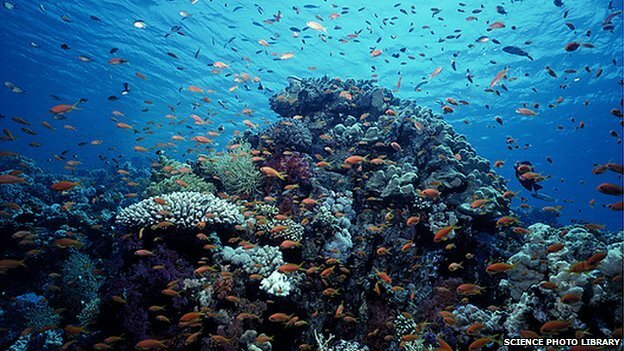 Coral reefs, for instance, are suffering from the higher temperatures and the effects of acidification whilst also being weakened by bad fishing practices, pollution, siltation and toxic algal blooms. IPSO, funded by charitable foundations, is publishing a set of five papers based on workshops in 2011 and 2012 in partnership with the International Union for Conservation of Nature (IUCN’s) World Commission on Protected Areas. The reports call for world governments to halt CO2 increase at 450ppm. Any higher, they say, will cause massive acidification later in the century as the CO2 is absorbed into the sea. It urges much more focused fisheries management, and a priority list for tackling the key groups of chemicals that cause most harm. It wants the governments to negotiate a new agreement for the sustainable fishing in the high oceans to be policed by a new global high seas enforcement agency. The IUCN’s Prof Dan Laffoley said: "What these latest reports make absolutely clear is that deferring action will increase costs in the future and lead to even greater, perhaps irreversible, losses. "The UN climate report confirmed that the ocean is bearing the brunt of human-induced changes to our planet. These findings give us more cause for alarm – but also a roadmap for action. We must use it." The co-coordinator, Prof Alex Rogers from Oxford University has been asked to advise the UN's own oceans assessment but he told BBC News he had led the IPSO initiative because: "It’s important to have something which is completely independent in any way from state influence and to say things which experts in the field felt was really needed to be said." He said concern had grown over the past year thanks to papers signalling that past extinctions had involved warming seas, acidification and low oxygen levels. All are on the rise today. He agreed there was debate on whether fisheries are recovering by better management following examples in the US and Europe, but said it seemed clear that globally they were not. He also admitted a debate about whether overall climate change would increase the amount of fish produced in the sea. Melting sea ice would increase fisheries near the poles whilst stratification of warmer waters in the tropics would reduce mixing of nutrients and lead to lower production, he said. He said dead zones globally appeared to be increasing although this may reflect increased reporting. "On ocean acidification, we are seeing effects that no-one predicted like the inability of fish to detect their environments properly. It’s clear that it will affect many species. We really do have to get a grip on what’s going on in the oceans," he said.